Solve your mission-critical IT challenges of managing and keeping secure the capabilities and data crucial to your business with a powerful and reliable Intel® Xeon® processor E7 family based server. These top-of-the-line processors deliver performance that is ideal for your most data-demanding workloads with improved scalability and increased memory and I/O capacity, allowing you to handily adapt to changes in short-term business demands and address requirements for longer-term business growth. These advanced reliability and security features work to maintain data integrity, accelerate encrypted transactions, and maximize the availability of mission-critical applications. 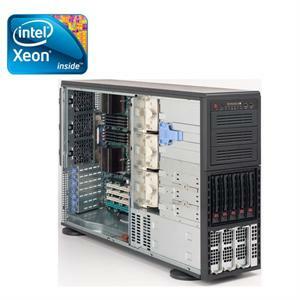 The powerful and reliable Intel® Xeon® processor E7 family servers provide flexibility for your business critical solutions.